Thank you all for your continued support of my Kickstarter project, Thailand Burma Flora Fauna! 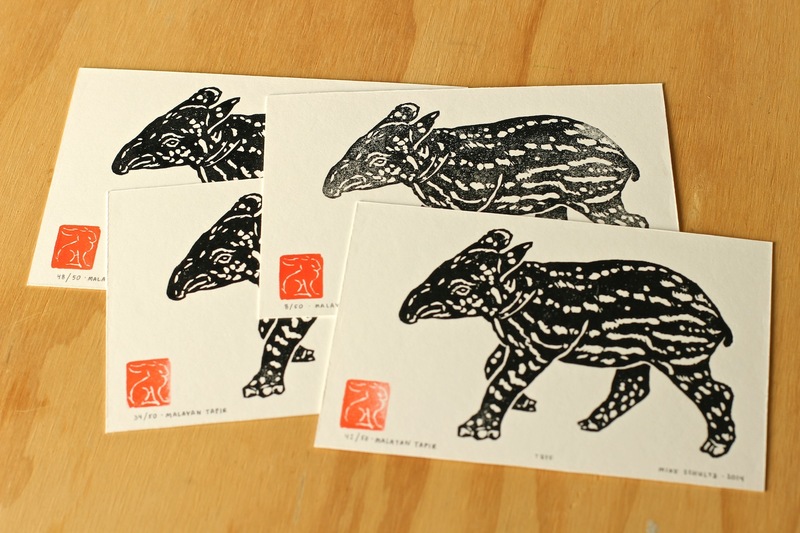 The second of the smaller prints featuring a young Malayan tapir is complete and being shipped out this week! A handful of these limited edition linocut prints are now available in my Etsy shop. The Malayan tapir is an endangered species still found in remote locations in Thailand and Burma. Its populations once thrived in SE Asia, but after overhunting, poaching, and habitat loss from deforestation, the number of native tapirs have dwindled. It is now a protected species rarely found in the wild. 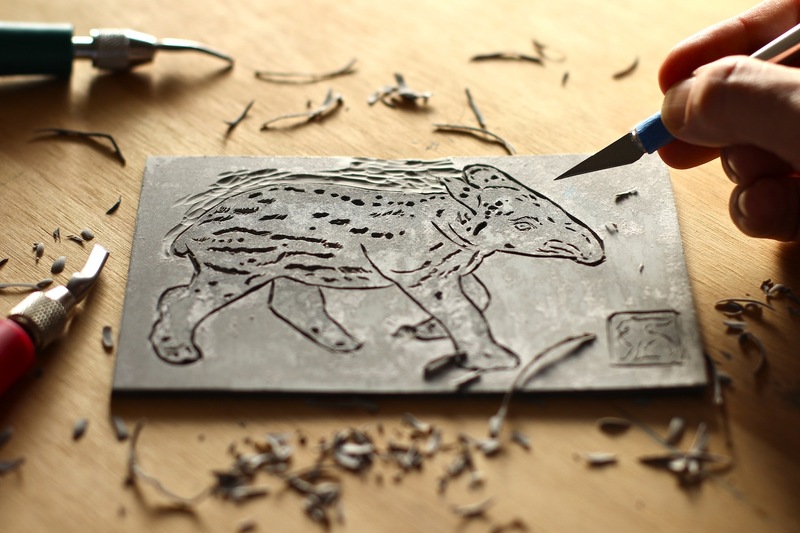 Carefully hand carving the linoleum block for the Malayan tapir print. The adult Malayan tapir boasts a striking solid black body with a large band of white across its back. The breaking up of its coloration is a natural camouflage in the forests of SE Asia. 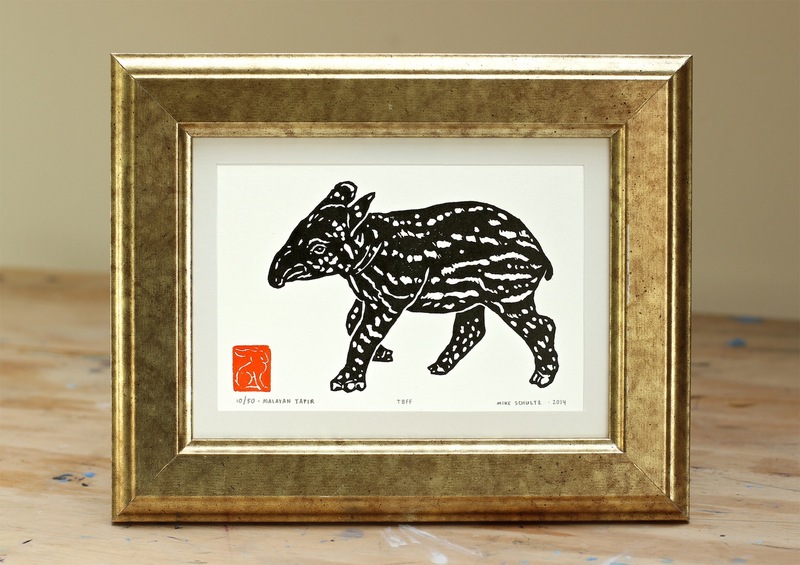 The juvenile Malayan tapir (like the one featured in this print) has a black body covered with spectacular white stripes and speckles, which also help to camouflage them while they are young. 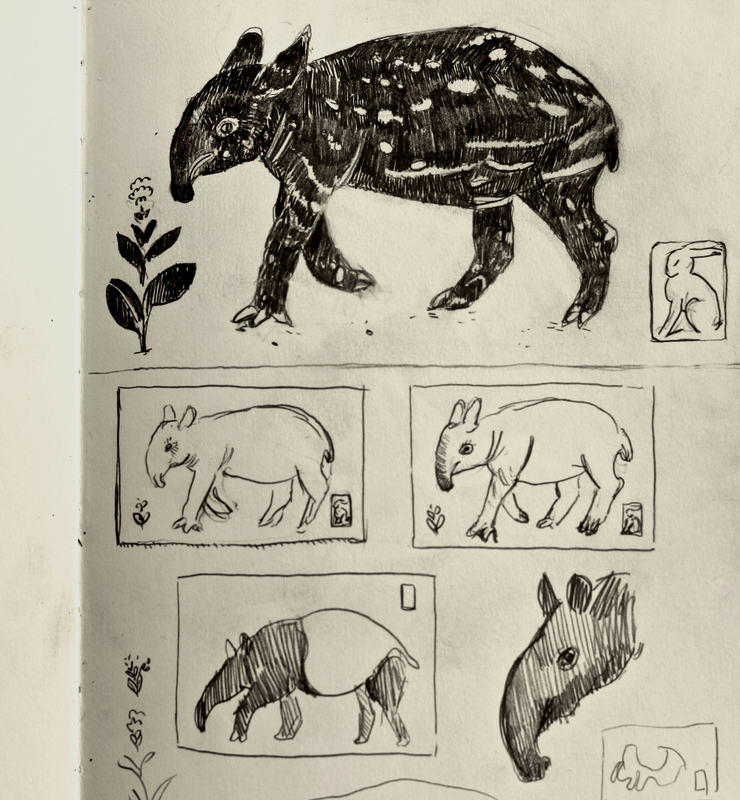 Drawing on a plane: loose preliminary sketchbook drawings for the tapir print. Note the sketch of an adult Malayan tapir (bottom left) with a solid black and white body. 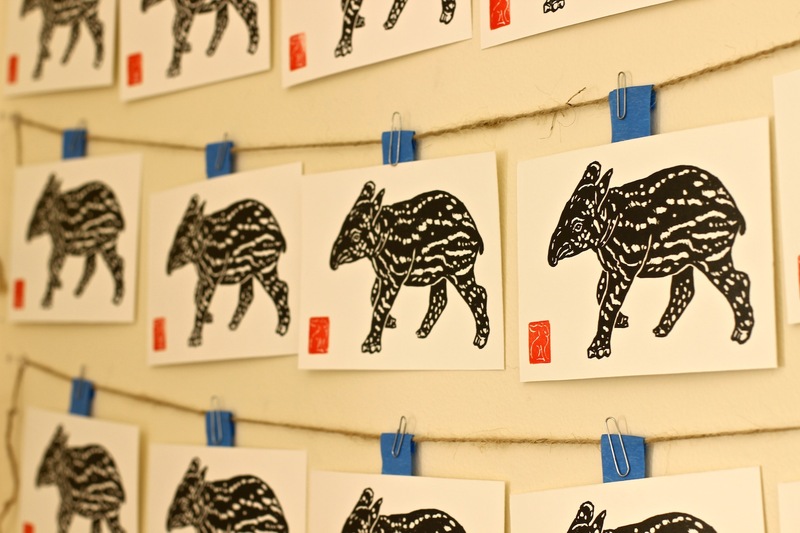 Tapir prints hanging to dry on the wall of my studio. The Malayan tapir is an herbivorous creature with a flexible snout like that of an elephant’s trunk. It has poor eyesight, but an excellent sense of smell and hearing. They can grow in length to be 2.4 meters (7 feet 10 inches), and have been found to weight up to 1,190 pounds! They are crepuscular animals– meaning creatures who are mostly active during the twilight hours of dawn and dusk. The tapir is described as being “mostly, but not exclusively, nocturnal” as it commonly naps during the middle of the night. Don’t we all? Each handmade print is unique, with slight variations and printing character. A lone monotype of an elephant marches against a stampede of baby tapirs. 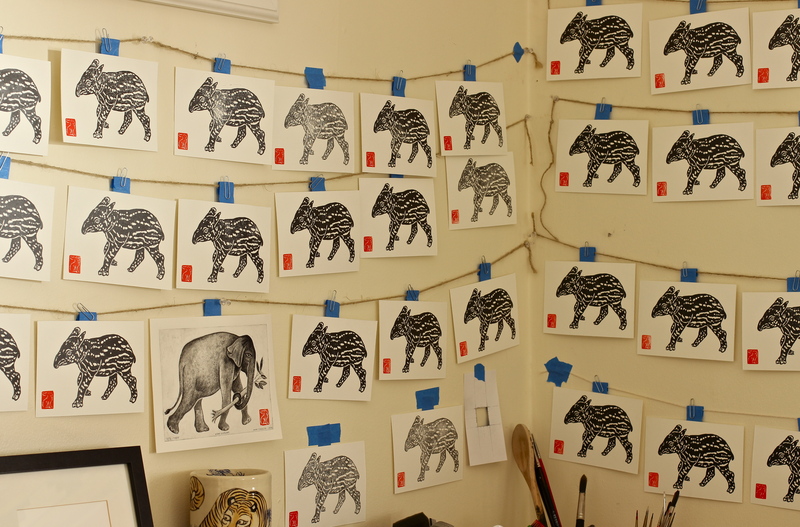 Process shot of a simple technology used to stamp the tapir prints. As seen above, I built a simple tool to aid in the stamping of my hare chop / signature. 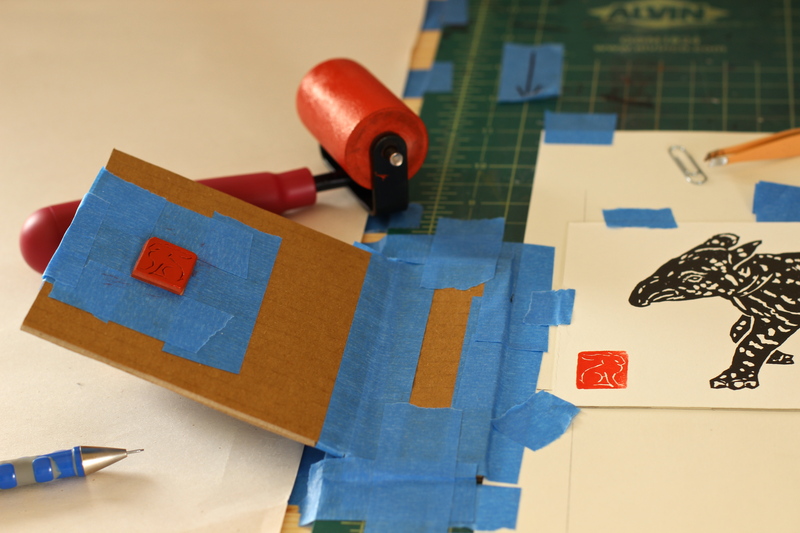 The wooden handled rubber stamp is securely held in a cardboard hinge which is aligned with a precisely placed print. After carefully inking the rubber stamp, the hinged tool helps to apply a relatively straight and consistently printed hare stamp. It worked well! Friend and artist Jack Baumgartner commented that this looked like some “good technology”. I really liked that description, and it prompted me to look up the definition of the word. Technology defined by Merriam-Webster is “a capability given by the practical application of knowledge”. 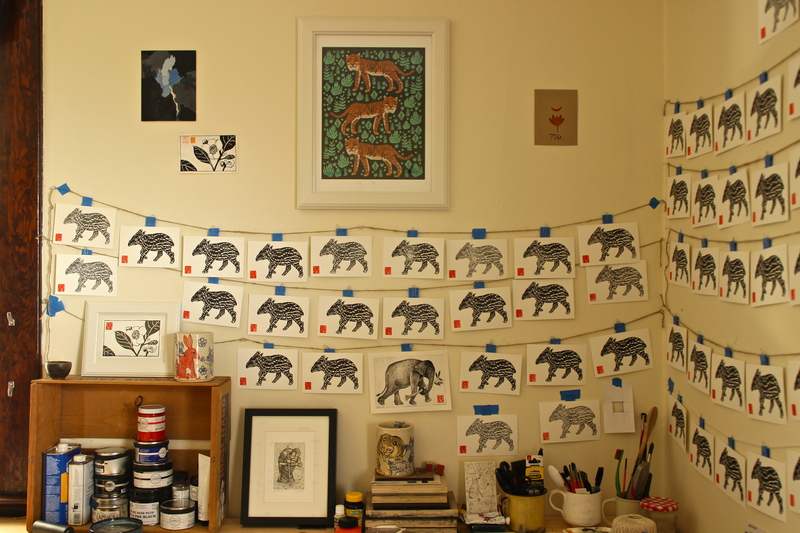 Studio shot with tapir prints drying on the walls. Working in good company– as seen above, my busy printmaking studio with additional inspiring artwork by friends Andrea Lauren, Joey Chiarello, Nieves Waleska, and Jack Baumgartner. Thank you all for your continued patience and support for the Thailand Burma Flora Fauna project! I am impressed, Mikey, with the perspective, volume and weight of the tapir, for being so simple and reserved an image. it is so effective. I think that this is a beautiful achievement. Thank you, my friend! Hope you don’t mind that I quoted you and gave you a couple shouts in there too. Slowly, but steadily getting closer to my goal! Still available to buy? Ship to Germany? 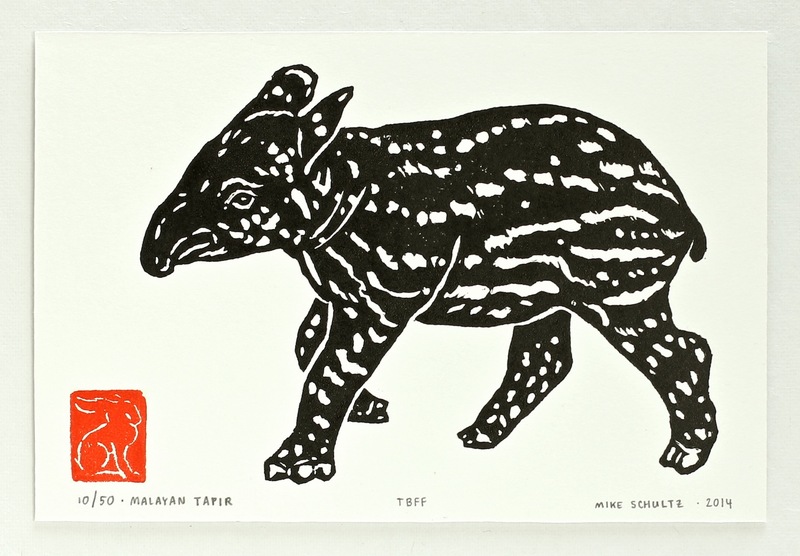 You are currently reading Young Malayan Tapir – Linocut at Mike Schultz Studio Blog.